The ideas of Aristotle and Plato, shown in Raphael's The School of Athens, were partly lost to Western Europeans for centuries. The transmission of the Greek Classics to Latin Western Europe during the Middle Ages was a key factor in the development of intellectual life in Western Europe. Interest in Greek texts and their availability was scarce in the Latin West during the earlier Middle Ages, but as traffic to the East increased so did Western scholarship. Classical Greek philosophy consisted of various original works ranging from those from Ancient Greece (e.g. Aristotle) to those Greco-Roman scholars in the classical Roman Empire (e.g. Ptolemy). Though these works were originally written in Greek, for centuries the language of scholarship in the Mediterranean region, many were translated into Syriac, Arabic, and Persian during the Middle Ages and the original Greek versions were often lost. As the Arab caliphates absorbed Greek/Roman knowledge, the medieval Islamic world gradually became the dominant intellectual center in the Mediterranean region. Subsequent efforts at Latin translations of Arab scholarship, including the Greek classics, began what would later be known as the Renaissance in the West. With increasing Western presence in the East due to the Crusades, and the gradual collapse of the Byzantine Empire during the later Middle Ages, many Byzantine Greek scholars fled to Western Europe bringing with them many original Greek manuscripts, and providing impetus for Greek-language education in the West and further translation efforts of Greek scholarship into Latin. The line between Greek scholarship and Arab scholarship in Western Europe was very blurred during the Middle Ages and the early Modern Period. Westerners were often biased toward giving credit for knowledge they received to the Greeks, who were perceived as Christians, rather than the Arab Muslims. Thus, depending of context, the concept of the transmission of Greek Classics is often used to refer to the collective knowledge that was obtained from the Arab and Byzantine Empires, regardless of where the knowledge actually originated. It has been argued, on the other hand, that even those scholars whose works and translations were written in Arabic were not native Arabs, but rather Persians or Syrians under forced Islamic rule; this makes the matter less clear than many 20th century scholars, following the "convivencia" theory of A. Castro or one of its variants, had previously suggested. As knowledge of Greek declined in the west with the fall of the Western Roman Empire, so did knowledge of the Greek texts, many of which had remained without a Latin translation. The fragile nature of papyrus, as a writing medium, meant that older texts not copied onto expensive parchment would eventually crumble and be lost. After the Fourth Crusade (1202–1204) and the Sack of Constantinople (1204), scholars such as William of Moerbeke gained access to the original Greek texts of scientists and philosophers, including Aristotle, Archimedes, Hero of Alexandria and Proclus, that had been preserved in the Byzantine (Eastern Roman) Empire, and translated them directly into Latin. The final decline and collapse of the Byzantine empire in the fifteenth century heightened contact between its scholars and those of the west. Translation into Latin of the full range of Greek classics ensued, including the historians, poets, playwrights and non-Aristotelian philosophers. Manuel Chrysoloras (c. 1355–1415) translated portions of Homer and Plato. Guarino da Verona (1370–1460) translated Strabo and Plutarch. Poggio Bracciolini (1380–1459) translated Xenophon, Lucan and Diodorus. Francesco Filelfo (1398–1481) translated portions of Plutarch, Xenophon and Lysias. Lorenzo Valla (1407–1457) translated Thucydides and Herodotus. Marsilio Ficino (1433–1499) and his Platonic Academy translated Plato. Poliziano (1454–1494) translated Herodian and portions of Epictetus and Plutarch. Regiomontanus and George of Trebizond translated Ptolemy's Almagest. Important patrons were Basilios Bessarion (1403–1472) and Pope Nicholas V (1397–1455). Syriac plays an important role in modern text-criticism even today. The Oxford Classical issue of the Greek text of Aristotle's Organon uses the sigla Ρ, Ι, and Γ, which are texts dating from Christian possessions from the 6th to 8th century. Syriac translations played a major role for the later reception into Arabic. These translators from Syriac were mostly Nestorian and Jacobite Christians, working in the two hundred years following the Abbasid period. The most important translator of this group was the Syriac-speaking Christian Hunayn Ibn Ishaq (809-873), known to the Latins as Joannitius. Classical Greek learning was firmly found in every metropolis of the Roman empire, including in Rome itself. In Rome, Boethius propagated works of Greek classical learning. Boethius intended to pass on the great Greco-Roman culture to future generations by writing manuals on music and astronomy, geometry, and arithmetic. Several of Boethius' writings, which were largely influential during the Middle Ages, drew from the thinking of Porphyry and Iamblichus. Boethius wrote a commentary on the Isagoge by Porphyry, which highlighted the existence of the problem of universals: whether these concepts are subsistent entities which would exist whether anyone thought of them, or whether they only exist as ideas. This topic concerning the ontological nature of universal ideas was one of the most vocal controversies in medieval philosophy. Besides these advanced philosophical works, Boethius is also reported to have translated important Greek texts for the topics of the quadrivium. His loose translation of Nicomachus's treatise on arithmetic (De institutione arithmetica libri duo) and his textbook on music (De institutione musica libri quinque, unfinished) contributed to medieval education. De arithmetica, begins with modular arithmetic, such as even and odd, evenly even, evenly odd, and oddly even. He then turns to unpredicted complexity by categorizing numbers and parts of numbers. His translations of Euclid on geometry and Ptolemy on astronomy, if they were completed, no longer survive. Boethius made Latin translations of Aristotle's De interpretation and Categories with commentaries. These were widely used during the Middle Ages. In the Western Provinces (what today is considered the Western Europe's heartland), the collapsing Roman empire lost many Greek manuscripts which were not preserved by monasteries. However, due to the expense and dearth of writing materials, monastic scribes could recycle old parchments. The parchments could be reused after scraping off the ink of the old texts, and writing new books on the previously used parchment, creating what is called a palimpsest. Fortunately for modern scholars, the old writing can still be retrieved, and many extremely valuable works, which would have otherwise been lost, have been recovered in this way. As the language of Roman aristocrats and scholars, Greek died off along with the Roman Empire in the West, and by 500 CE, almost no one in Western Europe was able to read (or translate) Greek texts, and with the rise of the Islamic Empire, the west was further cut off from the language. After a while, only a few monasteries in the west had Greek works, and even fewer of them copied these works (mainly the Irish). Some Irish monks had been taught by Greek and Latin missionaries who probably had brought Greek texts with them. William of Moerbeke was one of the most prolific and influential translators of Greek philosophical texts in the middle half of the thirteenth century. Very little is known of William's life. He was born probably in 1215 in the village of Moerbeke, now in Belgium, and probably entered the Dominican priory in Leuven as a young man. Most of his surviving work was done during 1259-72. Though William's contribution to the "recovery" of Aristotle, in the 13th century, was not as significant as is sometimes claimed, his work undoubtedly helped in forming a clearer picture of Greek philosophy, and particularly of Aristotle, than was given by the Arabic versions on which they had previously relied, and which had distorted or obscured the relation between Platonic and Aristotelian systems of philosophy. William's translation of Proclus was also important, demonstrating that the influential book Liber de Causis, was not a genuine work of Aristotle, but rather derived from Proclus' Elementatio Theologica. According to a tradition originating in the later Middle Ages, William knew Thomas Aquinas and was commissioned by him to make some of the translations. But there is no contemporary record of the friendship or the commissions. If they did meet, it is most likely during the three or four years Aquinas was working at Orvieto, i.e. not before the election of Pope Urban IV in August 1261, who invited Aquinas to serve at the Papal court, and not after 1265, when Aquinas left for Rome. His translation of De motu animalium is cited by Thomas in Summa Contra Gentiles, probably completed in 1264. Western Arabic translations of Greek works (found in Iberia and Sicily) originates in the Greek sources preserved by the Byzantines. These transmissions to the Arab West took place in two main stages. An Arab's depiction of Socrates teaching his students. The first period of transmission during 8th and 9th centuries was preceded by a period of conquest, as Arabs took control of previously Hellenized areas such as Egypt and the Levant in the 7th century. At this point they first began to encounter Greek ideas, though from the beginning, many Arabs were hostile to classical learning. Because of this hostility, the religious Caliphs could not support scientific translations. Translators had to seek out wealthy business patrons rather than religious ones. Until Abbasid rule in the 8th century, however, there was little work in translation. Most knowledge of Greek during Umayyad rule was gained from those scholars of Greek who remained from the Byzantine period, rather than through widespread translation and dissemination of texts. A few scholars argue that translation was more widespread than is thought during this period, but theirs remains the minority view. The main period of translation was during Abbasid rule. The 2nd Abbasid Caliph al-Mansur moved the capital from Damascus to Baghdad. Here he founded the great library with texts containing Greek Classical texts. Al-Mansur ordered this rich fund of world literature translated into Arabic. Under al-Mansur and by his orders, translations were made from Greek, Syriac, and Persian, the Syriac and Persian books being themselves translations from Greek or Sanskrit. The 6th-century King of Persia, Anushirvan (Chosroes I) the Just, had introduced many Greek ideas into his kingdom. Aided by this knowledge and juxtaposition of beliefs, the Abbasids considered it valuable to look at Islam with Greek eyes, and to look at the Greeks with Islamic eyes. Abbasid philosophers also pressed the idea that Islam had from the very beginning stressed the gathering of knowledge as important to the religion. These new lines of thought allowed the work of amassing and translating Greek ideas to expand as it never before had. The Caliph al-Mansur was the patron who did most to attract the Nestorian physicians to the city of Baghdad which he had founded, and he was also a prince who did much to encourage those who set themselves to prepare Arabic translations of Greek, Syriac, and Persian works. Still more important was the patronage given by the Caliph al-Ma'mun, who in A.H. 217 (= A.D. 832) founded a school at Baghdad, suggested no doubt by the Nestorians and Zoroastrian schools already existing, and this he called the Bayt al-Hikma or "House of Wisdom", and this he placed under the guidance of Yahya ibn Masawaih (d. A.H. 243 = A.D. 857), who was an author both in Syriac and Arabic, and learned also in the use of Greek. His medical treatise on "Fevers" was long in repute and was afterwards translated into Latin and into Hebrew. 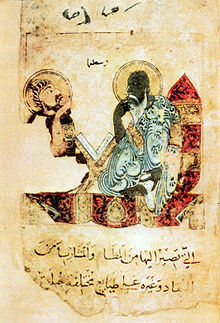 The most important work of the academy however was done by Yahya's pupils and successors, especially Abu Zayd Hunayn ibn Ishaq al-Ibadi (d. 263 A.H. = A.D. 876), the Nestorian physician to whom we have already referred as translating into Syriac the chief medical authorities as well as parts of Aristotle's Organon. After studying at Baghdad under Yahya he visited Alexandria and returned, not only with the training given at what was then the first medical school, but with a good knowledge of Greek which he employed in making translations in Syriac and Arabic. Later the Caliph al-Mamun also sent emissaries to the Byzantines to gather Greek manuscripts for his new university, making it a center for Greek translation work in the Arab world. At first only practical works, such as those on medicine and technology were sought after, but eventually works on philosophy became popular. Most scholars agree that during this period rhetoric, poetry, histories, and dramas were not translated into Arabic, since they were viewed as serving political ends which were not to be sought after in Arab states. Instead, philosophical and scientific works were almost the entire focus of translation. This has been disputed by a minority of scholars, however, who argue that stories such as the Arabian Nights carry clear parallels to Greek literature—evidence that many Arabs were familiar with Greek humanities more than is thought. A medieval Arabic representation of Aristotle teaching a student. Al-Kindi (Alkindus), a famous logician and prominent figure in the House of Wisdom, is unanimously hailed as the "father of Islamic or Arabic philosophy". His synthesis of Greek philosophy with Islamic beliefs met with much opposition, and at one point he was flogged by those opposed to his ideas. He argued that one could accept the Koran and other sacred texts, and work from that point to determine truth. Whenever he ran into an impasse, he would abandon the Greek ideas in favor of the Islamic faith. He is considered to be largely responsible for pulling the Arab world out of a mystic and theological way of thinking into a more rationalistic mode. Previous to al-Kindi, for example, on the question of how the immaterial God of the Koran could sit on a throne in the same book, one theologist had said, “The sitting is known, its modality is unknown. Belief in it is a necessity, and raising questions regarding it is a heresy.” Few of al-Kindi's writings have survived, making it difficult to judge his work directly, but it is clear from what exists that he carefully worked to present his ideas in a way acceptable to other Muslims. After Al-Kindi, several philosophers argued more radical views, some of whom even rejected revelation, most notably the Persian logician, Al-Razi or “Rhazes.” Considered one of the most original thinkers among the Persian philosophers[by whom? ], he challenged both Islamic and Greek ideas in a rationalist manner. Also, where Al-Kindi had focused on Aristotle, Al-Rhazi focused on Plato, introducing his ideas as a contrast. After Al-Kindi, Al-Farabi (Alpharabius) introduced Neoplatonism through his knowledge of the Hellenistic culture of Alexandria. Unlike Al-Kindi or Al-Rhazi, Al-Farabi was hesitant to express his own feelings on issues of religion and philosophy, choosing rather to speak only through the words of the various philosophies he came across. Decades after Al-Farabi, Ibn Sina (Avicenna) compiled the ideas of many Muslim philosophers of the previous centuries and established a new school which is known as Avicennism. After this period, Greek philosophy went into a decline in the Islamic world. Theologians such as Al-Ghazali argued that many realms of logic only worked in theory, not in reality. His ideas would later influence Western European religious ideas. In response to Al-Ghazali's The Incoherence of the Philosophers, the Andalusian philosopher Ibn Rushd (Averroes), the most famous commentator on Aristotle and founder of Averroism, wrote a refutation entitled The Incoherence of the Incoherence. By 1200, when philosophy was again revived in the Islamic world, Al-Kindi and Al-Farabi were no longer remembered, while Ibn Sina's compilation work still was. Ibn Sina, otherwise known as Avicenna, would later heavily influence European philosophical, theological and scientific thought, becoming known as “the most famous scientist of Islam” to many Western historians. While Greek ideas gradually permeated the Islamic world, Muslims conquests extended to the European continent. Spain was conquered by the Arabs around 700 AD, even reaching as far as Poitiers, France by 732 (Battle of Tours). By 902 Sicily was conquered. With the aid of Greek and other ideas, Spain in particular quickly became the most heavily populated and thriving area in Europe. One of the rulers of Muslim Spain, Al-Hakam II, made an effort to gather books from all over the Arab world, creating a library which would later become a center for translation into Latin. As books were gathered, so were many Arab scholars who had studied Greek ideas in the east. For example, Muhammud ibn 'Abdun and 'Abdu'l-Rahman ibn Ismail came to Spain and introduced many ideas about medicine as well as several of the works of Aristotle and Euclid. Ibn Bajjah (known as "Avempace") and Ibn Rushd (known as “Averroes”) were among the other famous philosophers of Spain who furthered the expansion of Greek ideas in medicine and philosophy. Prior to Averroes, many Arab philosophers had confused Aristotle with Plotinus, a Hellenized Egyptian who founded Neoplatonism and had mixed Aristotle's ideas with Plato's. Averroes rediscovered the “true” Aristotle by translating key texts reintroducing him to Arab Spain. He also challenged Al-Ghazali's largely anti-Greek philosophies and offered some of the best reconciliation of Islam and philosophy of the time. Key to his arguments was the idea that although there was only one truth, that truth could be expressed in many ways, including both philosophy and religion. He even used the Qur'an to back up his arguments in favor of Greek philosophy and logic, especially the passage: “It is He, [O Muhammad] who has revealed the Book to you...some of its verses are unambiguous...and the others are ambiguous...only God and those confirmed in knowledge know its interpretation.” Averroes argued that “those confirmed in knowledge” were philosophers. The Christian medieval scholar St. Jerome (here depicted by Domenico Ghirlandaio, church of Ognissanti, Florence) was against many Greek ideas. While Muslims were busy translating and adding their own ideas to Greek philosophies, the Latin West was still suspicious of pagan ideas. Leaders of the Orthodox Church in the Byzantine Empire also frowned upon philosophy, and the Empire had just gone through a period of plague, famine, and war. Further west, several key figures in European history who came after Boethius had strengthened the overwhelming shift away from Greek ideas. For centuries, Greek ideas in Europe were all but non-existent, until the Eastern part of the Roman Empire – Byzantine – was sacked during the crusades unlocking numerous Greek texts. Within Western Europe, only a few monasteries had Greek works, and even fewer of them copied these works. There was a brief period of revival, when the Anglo-Saxon monk Alcuin and others reintroduced some Greek ideas during the Carolingian Renaissance of the 8th century. After Charlemagne's death, however, intellectual life again fell into decline. By the 12th century, however, scholastic thought was beginning to develop, leading to the rise of universities throughout Europe. These universities gathered what little Greek thought had been preserved over the centuries, including Boethius' commentaries on Aristotle. They also served as places of discussion for new ideas coming from new translations from Arabic throughout Europe. By the 12th century, European fear of Islam as a military threat had lessened somewhat. Toledo, in Spain, had fallen from Arab hands in 1085, Sicily in 1091, and Jerusalem in 1099. These linguistic borderlands proved fertile ground for translators. These areas had been conquered by Arab Greek and Latin-speaking peoples over the centuries and contained linguistic abilities from all these cultures. The small and unscholarly population of the Crusader Kingdoms contributed very little to the translation efforts, until the Fourth Crusade took most of the Byzantine Empire. Sicily, still largely Greek-speaking was more productive; it had seen rule under Byzantines, Arabs, and Italians, and many were fluent in Greek, Arabic, and Latin. Sicilians, however, were less influenced by Arabs and instead are noted more for their translations directly from Greek to Latin. Spain, on the other hand, was an ideal place for translation from Arabic to Latin because of a combination of rich Latin and Arab cultures living side by side. As early as the 10th century, scholars in Andalusia had begun to gather translated texts, and in the latter half of that century began transmitting them to the rest of Europe. After the Reconquista of the 12th century, however, Spain opened even further for Christian scholars, who were now able to work in “friendly” religious territory. As these Europeans encountered Islamic philosophy, their previously held fears turned to admiration, and from Spain came a wealth of Arab knowledge of mathematics and astronomy. Foreigners came to Spain to translate from all over Europe, and Toledo became a center for such travelers, since so many of its citizens wrote daily in both Arabic and Latin-based languages. Although there was a huge amount of work being accomplished in Spain, there was no central school for translating and no real organized effort, as there had been at times among the Arabs. Translators came from many different backgrounds and translated for many different reasons. For example, non-Christian Jewish scholars participated by translating Arabic works which had already been translated into Hebrew, into Latin and Vulgate languages. Some scholars, however, have suggested that Raymond de Sauvetât the Archbishop of Toledo, seems to have started an organized movement of support for translations, and many scholars who seem to be associated with him in documents may have translated two-by-two, working together. Whether Raimond actually started a truly central, organized effort at translation, later generalized as the Toledo School of Translators, remains unknown. What is known is that most translations coming out of Spain dealt with either medicine or astronomy. Hugo of Santalla, for example, translated a large selection of Arabic works all dealing with astronomy, as well as tracing the history of astronomic thought through history, underscoring the work of the Greeks, Persians, Hellenists, and Arabs in one large preface to his volume. By the 13th century, translation had declined in Spain, but it was on the rise in Italy and Sicily, and from there to all of Europe. Adelard of Bath, an Englishman, traveled to Sicily and the Arab world, translating works on astronomy and mathematics, including the first complete translation of Euclid's Elements. Powerful Norman kings gathered men of high knowledge from Italy, and other areas, into their courts, as signs of prestige. Even the Byzantines experienced an Aristotelian revival in the mid-12th century, and gathered men from Italy as well. ^ a b Western Civilization: Ideas, Politics, and Society, Marvin Perry, Myrna Chase, Margaret C. Jacob, James R. Jacob, 2008, 903 pages, p.261/262, Google Books webpage: BooksG-kK. ^ L. Minio-Paluello. Aristoteles Categoriae et liber de interpretatione recognovit brevique adnotation instruxit. Oxford Classical Texts. ^ General Audience of Pope Benedict XVI, Boethius and Cassiodorus; accessed November 4, 2009. ^ Stanford Encyclopedia of Philosophy, Anicius Manlius SeverinusBoethius. Internet. Availablefrom http://plato.stanford.edu/entries/boethius/; accessed November 7, 2009. Herbermann, Charles, ed. (1913). "Anicius Manlius Severinus Boethius" . Catholic Encyclopedia. New York: Robert Appleton Company. ^ Schrader, Dorothy V. ´De Arithmetica, Book I, of Boethius.¡ Mathematics Teacher 61 (1968):615-28. ^ Masi, Michael. "The Liberal Arts and Gerardus Ruffus¢ Commentary on the Boethian De Arithmetica". The Sixteenth Century Journal 10 (Summer 1979): 24. ^ Reynolds & Wilson, Scribes and Scholars, (1991) p. 85-86 - But note that recycling of parchment did not necessarily prejudice against the genre, as Tischendorf's discovery of the Codex Sinaiticus shows. ^ O'Leary 1922, p. 112. Brickman, William W. “The Meeting of East and West in Educational History.” Comparative Education Review. (Oct 1961) 5.2 pgs. 82-89. Clagett, Marshall. “William of Moerbeke: Translator of Archimedes.” Proceedings of the American Philosophical Society. (Oct 1982) 126.5 pgs. 356-366. Grant, E. The Foundations of Modern Science in the Middle Ages, Cambridge 1996. Grabmann 1946, "Guglielmo di Moerbeke, O.P., il traduttore delle opere di Aristotele", Miscellanea Historiae Pontificiae, vol. XI, fasc. 20, Rome, 1946. Grunebaum, Gustave E. von. “Greek Form Elements in the Arabian Nights.” Journal of the American Oriental Society. (Dec 1942) 62.4 pgs. 277-292 . Laughlin, Burgess. The Aristotle Adventure a Guide to the Greek, Arabic, and Latin Scholars Who Transmitted Aristotle's Logic to the Renaissance. Flagstaff Ariz.: Albert Hale Pub., 1995. Lindberg, David C. (ed.). Science in the Middle Ages. Chicago: University of Chicago Press, 1978. Long, Pamela O. Technology and Society in the Medieval Centuries Byzantium, Islam, and the West, 500-1300. Washington DC: American Historical Association, 2003. O'Leary, De Lacy (1922). Arabic Thought and its Place in History. Palencia, A. Gonzalez. “Islam and the Occident”, Hispania. (October 1935) 18.3 pgs. 245-276. Pingree, David. “Classical and Byzantine Astrology in Sassanian Persia.” Dumbarton Oaks Papers. (1989) 43 pgs. 227-239. Reynolds, L. D., and N. G. Wilson. Scribes and Scholars: A Guide to the Transmission of Greek and Latin Literature. 3rd ed. Oxford: Clarendon Press, 1991. Rosenthal, Franz (Ed. and trans.). The Classical Heritage in Islam. Berkeley: University of California Press, 1975. Walbridge, John. “Explaining Away the Greek Gods in Islam.” Journal of the History of Ideas. (Jul 1998) 59.3 pgs. 389-403. Watt, W. Montgomery. The Influence of Islam on Medieval Europe. Edinburgh: University Press, 1972.